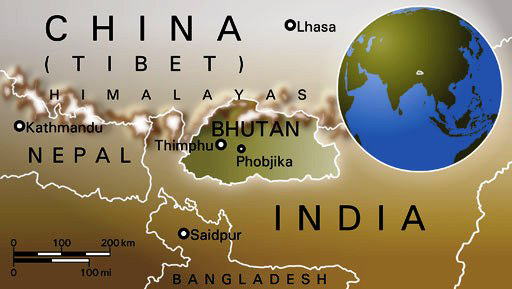 The tiny Kingdom of Bhutan lies hidden in the folds of the eastern Himalayas sandwiched between the two giant countries of India in the south and China in the north. 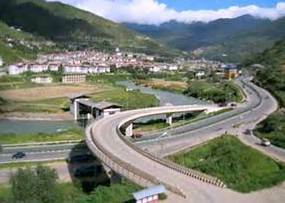 With a total area of 38,398 sq kilometers, approximately the size of Switzerland, Bhutan lies between 88° 45′ and 92°10′ longitude east and 26°40′ and 28°15 ‘ north. It is a mountainous country except for a small flat strip in the southern foothills. In the north we border with Tibet, the autonomous region under China, the Indian state of Arunachal Pradesh and in the south with the Indian states of Assam and West Bengal.